This is undoubtedly a very exciting time for me and although it is also a very expensive time, I am having such fun! A few anglers have asked me how am I able to afford such improvements at this present time….well the answer is hard work and a very understanding bank manager! My late Father worked very hard when he was alive to leave me a lovely trout fishery and I have worked very hard since he sadly passed away in 1997 to improve the complex even further. This June will see it all finished! March 2nd – A child’s school years aren’t only about learning how to read and write but how to have fun too! Jack has only been playing chess for just over a year and he is already well in to the ‘mood’ of the game. Kelly Prep completely encourages children to embrace the areas that they enjoy most and also the areas that they are good at. This is such an important factor as all children are different and this in turn builds confidence and self esteem. The enjoyment of seeing my son come home with the winning chess trophy from his school on this day was lovely and I know he deserves it because he has worked hard to understand the game in a very short space of time. Well done Jack! Jack has a 2 day chess competition in Maidenhead and another chess day at Abbey school in April. Good luck Jack! March 3rd – My favourite Sundays start off with a warm lie in with Mark and then one of his yummy breakfasts! This Sunday started off just how I like it but much to my disappointment it didn’t last long. At just after 10am I walked down to my office to retrieve my ‘mule’ (Honda four seater work horse). On my way down I passed Kingfisher Lake and I chatted to a few of my regulars, which I love, and I continued walking to the office. Unfortunately I was faced with an unhappy angler moaning about my new pricing structure and it was such a horrible moment for me. This particular angler is always having a pop at me, either because he hasn’t caught a big fish or he hasn’t caught a fish or he’s just in a bad mood. Well this day I explained to the angler that all the fish sizes were being increased but that made no difference to him, he still ran me down! I told the angler that if he carried on being rude, I would ban him and unfortunately he did just that. I told him that if he wanted to come onto my fishery again, I wanted an apology. March 9th – This was a very busy day with Mark putting up an arbour for me and Pete and Jeffrey tiding up around the fishery and putting up the new rabbit hutch etc. The evening ended beautifully for Mark and I, with a meal at The Peter Tavy Inn. A few too many brandies though, my favourite tipple of course! March 16th – A great friend of mine Peter (fatboy) erected my two new metal football goals in our children’s play area and they are brilliant! Four lovely new bunny rabbits were given to us by a lady at the school and they were immediately released into my large bunny area. Unfortunately they disappeared after a few hours and I was worried sick! We managed to find them down a burrow the next day! What a relief that was for them and me! March 18th – In the two weeks prior to this date I was worried with the increased numbers of dead fish that I was finding in my stock ponds and I could not find an explanation myself; so I called Robert Hughes from Skretting (fish food supplier) and asked him if he could help me. Robert told me that he thought it would be otters but I just didn’t believe him and so he kindly sent down a colleague of his. It was only minutes after he arrived that he confirmed it was definitely otters! I was so surprised but very relieved that it was nothing else that I had spent days worrying about! He showed me their foot prints around my ponds and I was amazed! Thanks Rob for being so helpful! There is a difference between the otters that come here and my anglers….these otters like small fish and my anglers like big fish! What a relief! March 18th – saw the first of the deliveries of my new promotional products arrive. I was so excited! Balloons, caps, mugs, pens and key rings etc. It was fun having a box to open nearly everyday! All these promotional products can be seen in our tackle shop and many are for sale. March 22nd – The fishery was all set for the big changeover the next day, there was nothing more I could do. 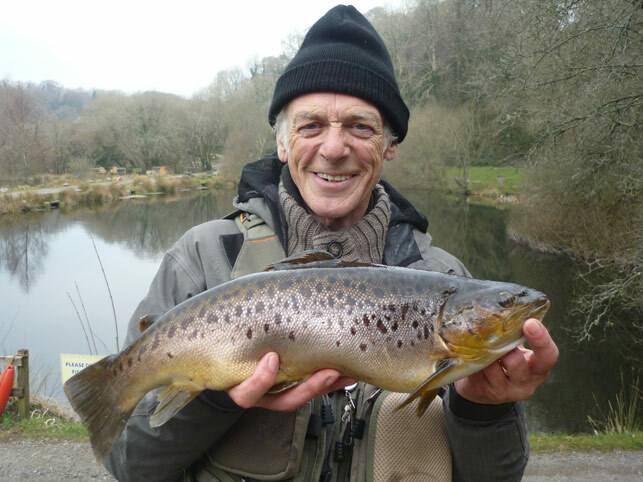 It was raining hard as regular guests Choy and Martin Andrews arrived from London for their top up of good quality trout fishing in The Dartmoor National Park! It always seems to rain when Choy and Martin are here but I was keeping my fingers crossed for some good weather the following day and I wasn’t disappointed! March 23rd – I woke up at 5.30 am and was down in the office by 6.15 am to start welcoming in the anglers and handing out their amazing goodie bags! The weather was dry but cold and the fishing for the first 2 hours was very slow and then all of a sudden, there were fish on everywhere! 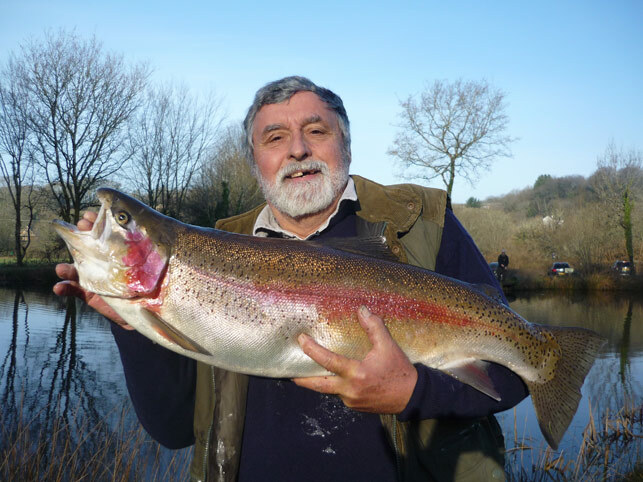 It wasn’t long before the scales were being tipped to 18lbs-8oz by Peter Styling (Photo above) from Somerset with his stunning Rainbow and Martin Andrews (photo below) from London also managed to catch a fine brown trout of 12lbs-8oz! John Boyd (photo 2nd below) also caught a fine triploid rainbow! The Saturday was the brighter and warmer of the two days, and the Sunday was much colder. Great fun was had by all and refreshments were provided in the lodge at 1pm. Saturday afternoon was a lovely opportunity for Mark and I to sit and relax with friends and drink two bottles of Champagne in the warm sun! Yummy! To say I was shattered at the end of this day was an understatement and it was a pure delight when Choy and Martin drove past me on their way to pick up a takeway and offered to pick me up tea! I was so excited! They treated me to fish and chips and they tasted lovely! Thanks Choy and Martin! A few smaller trout were still in the lakes from the previous months’ stocking and these should all be caught soon. Trout under 2lbs from Kingfisher and Heron Lakes and 3lbs from Osprey Lakes do not count towards your bag and should therefore be handed in and you can catch a replacement. Our aim in the future is to provide our Osprey Lakes with the majority of trout above 4lbs and Kingfisher and Heron with the majority trout above 2.5lbs. This will ensure that our anglers have a sporting chance of catching some lovely, fit, fighting trout! So dust off your tackle and come for a day’s sport soon! If you haven’t yet collected your tankard, please ask for it when you are next at the fishery and a photo of you with it would also be appreciated for our website. March 26th – After you load the kids in the car, it’s a real nightmare to find that it won’t start, and that’s just what happened this morning! I asked Jack if he wanted to go to school in the pick up (it squeals), mule or walk and his answer was mule! It is allowed to go on the road and it has tax but we don’t normally use it on the road. I think Jack and I must have laughed the whole way there and I laughed all the way back. It was such fun! 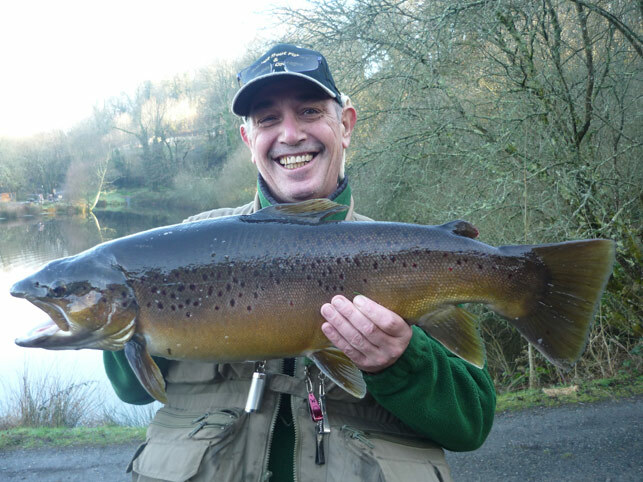 What an amazing day for Martin Andrews when he went on to land his 2nd brown trout of his 7 night holiday at the fishery! It was a stunning 10lbs specimen (photo below)! His dear wife Choy, who I absolutely love, has yet to catch a large brown at my fishery and I am sure she will try again next time! The evening was a real treat with a dip into the hot tub with my three sweet children! Always a lovely thing to do on a clear night, with a glass of cool brandy, coke and ice, and of course Olly Murs playing! That is our favourite cd in the hot tub! March 28th – A sort of a strange day when I saw something stuck in the netting on pond 4. I asked Jack to have a look and from a distance he thought it was a duck! I wasn’t convinced and so I took a look and realised it was a bird of prey! Quickly I thought and so we went and picked up my old 20 year old boat called Humfree! Not forgetting Humfree actually has several small holes in, I launched Nigel into the water and told him to be quick as it will sink! Humfree wouldn’t really sink quickly but Jack and I just couldn’t stop laughing! Nigel raced to the bird and returned as fast as he could and handed him to me. By now he was called Fred and a much loved Fred at that! I stood him on the grass and kept an eye on him as I worked. He was wobbly and one of his legs was bleeding but he didn’t take his eyes off us at all! He was a truly lovely looking bird. I decided that if he was still there after a few hours I would have to ring someone. Much to my disappointment he was still there after several hours and so along with some very helpful anglers we caught him and put him into a cage and I tried to ring the RSPB. After about 6 phone calls and no joy, I ended up ringing the local vet and they said I should take him in. 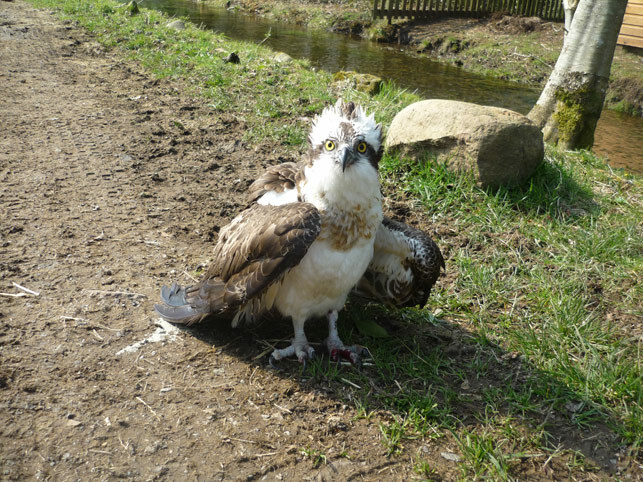 They said that he was a Buzzard but he was later identified by a bird specialist as an Osprey! I asked them to let me know how his recovery went and so I will update you in my next newsletter. Gorgeous Fred is pictured below! 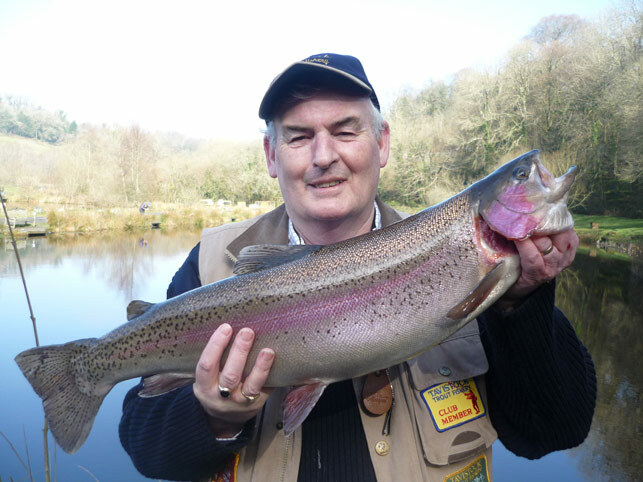 Wow, it’s amazing what delights you might see at this gorgeous fishery, bring your cameras! In the last month I have seen an abundance of wildlife including Kingfishers, Herons, Buzzards, Otters and, rarely seen in the South West of England the beautiful Osprey, a fish eating raptor, normally native to Scotland! 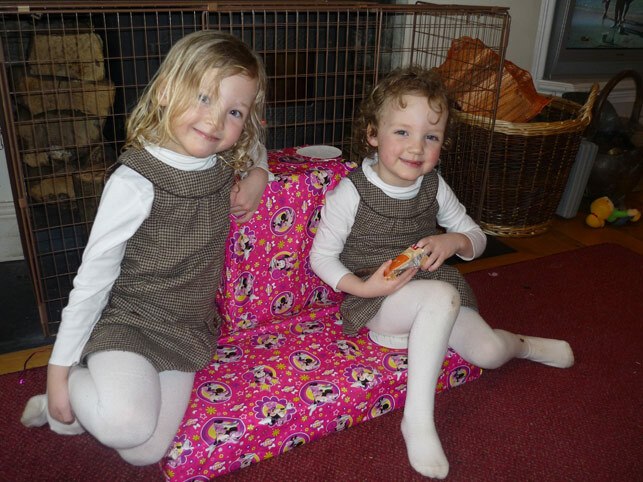 March 29th – Charlotte’s 5th Birthday and was she excited? Yes! Both she and her younger sister were bursting like jelly beans with excitement and it was lovely to see! Granny Lee popped over with gifts (photo below) and it was a lovely day! We finished it off with a family meal at The Peter Tavy Inn for the 5 of us and it was perfect! Mark and I both had pate to start and I had sea bass to follow, Mark was hungrier than me and so he went for the steak and stilton pie! Jack had fajitas and both girls opted for turkey dinosaurs! Amazing food and a wonderful evening! March 31st – Sundays, they are just my favourite day of the week! This one started with a cooked breakfast from Mark, I then stocked the lakes, fed the fish and then went for a trip down to Looe in Cornwall! Friends, Maria and Andrew Seabright met us there for lunch and although it was a very cold day it was good to spend time with my children and Mark off the fishery for a few hours. 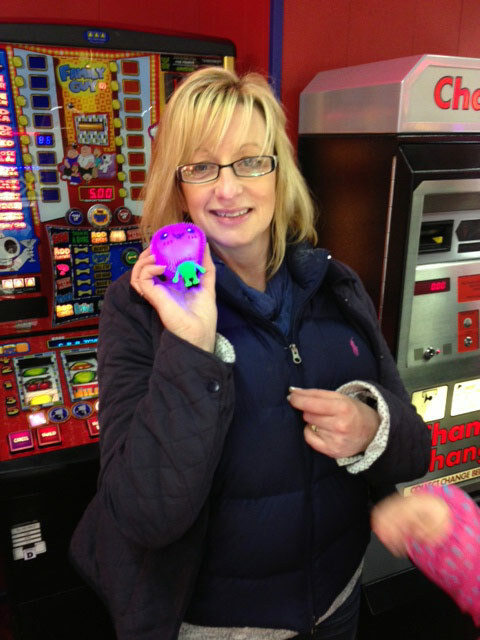 Although I answer the fishery phone 7 days a week, where ever I am, I still enjoy a hot chocolate and spending money in the 2p machines in the arcades! Mind you I think Mark enjoyed it just as much as me and on this particular day Maria and Andrew certainly seemed to enjoy it too! Below is a photo of Maria proudly holding her souvenir of our trip that day! 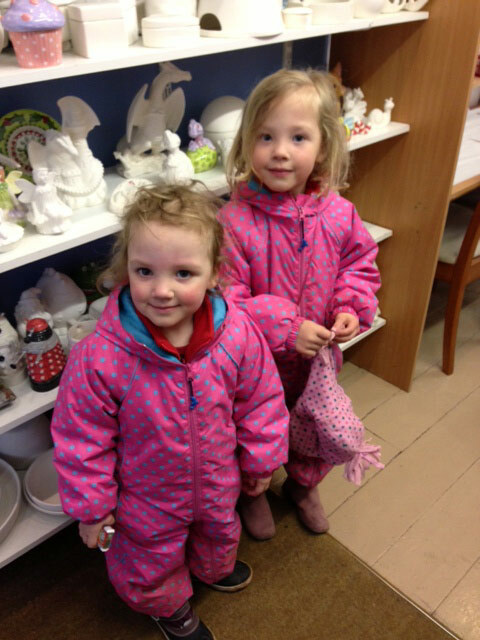 Charlotte and Amelia had a treat of painting a piece of pottery in the ‘Painting Pot’ in Looe. This lovely photo shows the wide range of pottery available for you to paint and I would highly recommend this activity for your children when you are on holiday! Its especially good if the weather is bad, as the room is lovely and warm! The Final Countdown to the completion the grounds! Unfortunately my late father, David Underhill died 15 years ago and was never able to finish the fishery with me but I have done it all in his memory! Those of you who never met my Father will probably find it hard to picture him and so I will try and help you. He was a genuine man who believed in working hard and not wasting money. He enjoyed buying chocolates and sweets for me when I was a child and I enjoyed eating them too! He didn’t spend a lot of money on himself in the years I remember and he would only have a cigarette if someone offered him one. He thoroughly enjoyed it when I ran our pub ‘The Trout and Tipple’ and I once closed the pub and went on holiday, asked him to look after it and of course when I returned the large brandy bottle was empty! A short story about my Father and I when I was only 23 years old, which not many people know! My father dreamed of erecting a bridge over the River Tavy and joining the A386, as our entrance on the B3357 was very dangerous. He found an old bailey bridge in Wales with no decking and bought it from the receivers for about £2,000. He applied for planning permission to erect a vehicular bridge over The River Tavy to form a new entrance for us. I thought that we should apply for planning for a foot bridge but dad said no, he wanted a vehicular bridge. We both went to the Dartmoor National Park planning meeting (end of 1994), sat at the back excitedly eating biscuits, chatting and got told to be quiet. When our application came up a few members spoke about our entrance being appalling and it was granted within minutes. We were both so happy! Dad unfortunately shortly after became poorly and ended up in Exeter hospital. While he was in hospital I received a phone call from a man in Wales asking me if I knew anything about a bridge in Aberanam, Wales with no decking, I immediately told him that my father had bought it to bring to Tavistock and to put over the river. This man was from the WDA and insisted that it was their bridge and asked me to prove purchase. I immediately set about trying to find the original invoice from the receivers and much to my disappointment it only said Wales. I phoned the receivers and asked if they could send me another invoice with the location of the bridge on it and they said no problem. After receiving the invoice I photocopied it and posted the WDA a copy and I then arranged to view some decking in Wales to buy for our bridge. I drove myself to Wales viewed some decking and called in to see my father in Hospital on the way home. He was delighted to see me, and I him. Shortly after my visit to Wales, I received a phone call from this man again saying that he had received the invoice and agreed it was ours. He then asked me if he could buy it as it was in exactly the place they wanted a bridge, knowing that it had no decking, I said yes if you buy me a replacement bridge. He said ok, you find one that you want and we will pay for it. I immediately phoned the man where I had viewed the decking and asked him if he had a secondhand bailey bridge with decking for sale and he said yes, it’s £17,000 plus Vat. I decided that this was a very good opportunity for me to sell our bridge with no decking and buy another bridge. I visited my father in hospital and told him what I was thinking of doing and he told me that I would never manage to pull such a deal off. I phoned the man back at the WDA and told him that my father was ill and we no longer wanted to build a bridge so could he please send me a cheque for the same amount of money as if I was buying a bridge and he said yes. It seemed like days between this phonecall and the cheque arriving for £20,000 but come in the post it did, and I was so happy! I rushed to the bank and put it in! My next task was to find a cheaper bridge with decking and so I made a call to the man who was going to erect our bridge for us and asked him to find me a cheap secondhand bridge. This he did, at an approximate cost of £7,000! My father and his accountant were both so very proud of me, and by the time he came out of hospital we had a healthier bank balance and a new bridge on its way from Wales with decking! Not bad for a 23 year old! After this he said to me ‘You’re wonderful you are and don’t you ever let anyone tell you any different.’ He used to talk to me about life without him and he also told me `To be strong and to stand up to people without him’, of course I reassured him that he would live for years. Dad taught me many of the things I know and the rest, along with a few tips from watching Lord Sugar’s TV programme ‘The Apprentice’, are self taught. Life without such a wonderful father is hard at times but his blood runs through my veins and I often think about him and that’s always very warming. He was an amazing man and missed by many, especially me! My close friend Lee Moran from Pennine Trout Fishery, Littleborough also gave me several tips when I first moved here over 20 years ago. I remember telling Lee that I really wanted to have a tackle shop and nice toilets and he told me to be patient! I wanted it all straight away but I learned that I had to wait. Lee is a really great guy, full of confidence, strength and always has a great car! Every woman’s dream man! Love you lots Lee, your cottage is still here for when you want it! June 16th – Kelly Preparatory School (parents and pupils) visit the fishery for a fly fishing morning and casting demonstration from Tim James. Refreshments will be provided. June 22nd(Sat) and June 23rd (Sun) – will be another special fly fishing weekend with the heaviest bags over the two days’ winning prizes. This will again apply to both sets of lakes. Of course it goes without saying that I will be stocking extra double figure rainbow and brown trout for this weekend and throughout the whole of June! Prizes will be announced in our May Newsletter. Free refreshments on both days for all anglers at 1pm and booking is advisable but not essential. 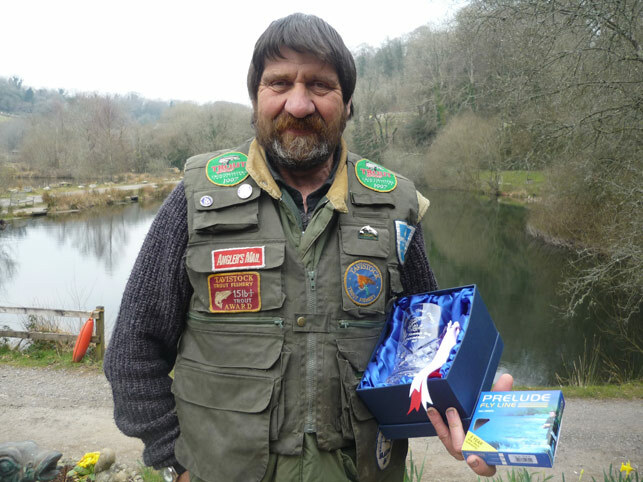 June 23rd (Sun) – will also be a Special Day with a Fly Casting Demonstration from Gary Champion. All anglers, non anglers, spectators and children are welcome to come and watch Gary cast a fly line. Refreshments will be provided for all spectators. There will be no charge for this as it is part of our June celebrations! June 30th – This is another special day when those who have worked hard on my cottages and fishery grounds over 24 years will be rewarded with a lovely lunch prepared and cooked by Hungry Hog South West! Beef, pork, sausages and roast potatoes, and I have been assured that all the meats will be from Palmers of Tavistock. Yummy homemade bread rolls and homemade sauces are also being prepared by Hungry Hog SW, it will be amazing! I might make a pudding or two and cook a trout, but that will be it for me! Tim James will be demonstrating after lunch how to cast a fly to those of my guests who have never seen an expert on the water! Well that’s a little look into my crystal ball! 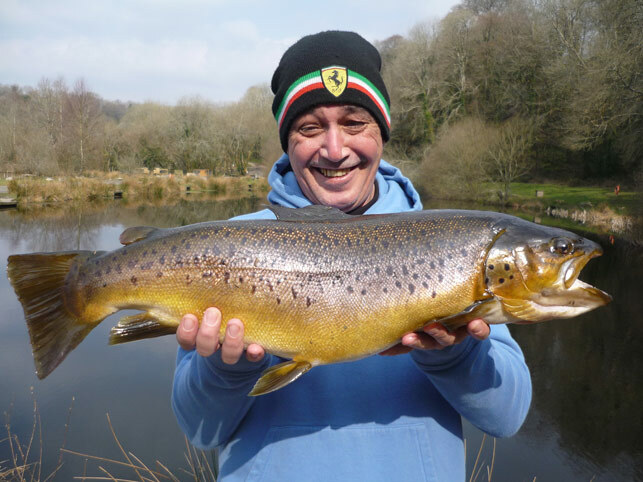 Fun is number one on the menu for June and the fishery will hopefully be glowing with fresh green grass, leafy trees and warm summer sun throughout June. I do hope that you will all join me during this special year for a holiday or a day’s fly fishing to celebrate my 24 years of hard work but of course the weekend of the 22nd and 23rd June will be amazing if you would like to come! 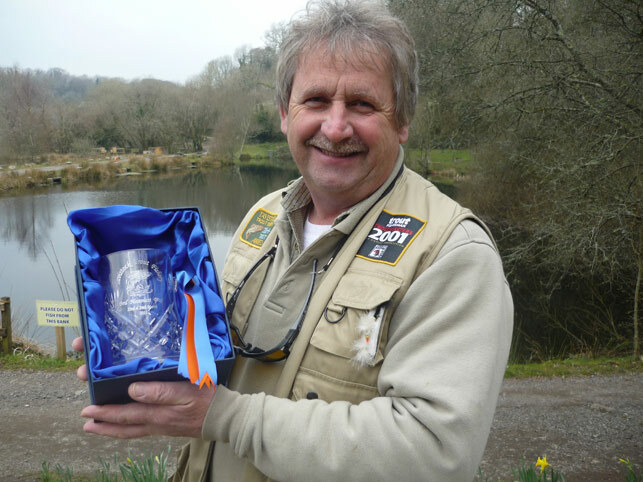 As I said the 23rd will be a very special day with Gary Champion casting a line and free refreshments (locally made cake from the WI stall in Tavistock and drinks) to all who want to come and watch! I will add a time to for Gary’s demonstration in the May Newsletter. These next 10 weeks or so will see the final finishing touches take place and all our hard work complete! Yippee! I would like to thank all the lovely people that have sent me nice comments about my fishery over the last month! It really puts the icing on the cake for me! One particular nice email was the one that I received from an angler of mine, Andrew Hepworth. Andrew is a Lieutenant Commander and I believe that he is out serving somewhere hot at the moment. Please look after yourself Andrew, and I hope to see you sat beside my lakes tempting out one of my large trout soon! If you would like one of our new leaflets posted to you, please ring or email me your postal address (contact details here).